Wisconsin gritted through the conditions to earn a trip back to Nationals. If you only looked at the Saturday of North Central Regionals, you wouldn’t think twice. Seeds held. North Central teams once more survived antarctic temperatures that would have sent most teams fleeing to the vans. Minnesota and Wisconsin, the regional favorites in a 1-bid region, left pool play still on top. They were likely mentally preparing to greet each other in the finals. The Minnesota Ninjas had an easy route to the semifinals, befitting their seed. They outscored their competition by 7+ point margins all weekend, and they should have been well-rested for Carleton. Instead, they entered a slugfest. The Ninjas broke early, and Carleton quickly broke back. For most of the second half Minnesota were on serve, until Carleton broke late to reach 12-11. Sarah Anciaux heavily decorated the stats sheet last weekend for Minnesota, but the team’s reliance on her playmaking magic hampered them in the semifinal. They counted on her for heroic moments a few too many times, in conditions that demanded consistency from the full roster. The final point would feature many turns and many spectacular defensive plays, particularly from Alyson Mohan-Lucas and Heather Taylor. Yet in the long, muddy double game point, Syzygy sealed Minnesota’s fate with a desperation huck that Naomi Price-Lazarus held onto in the endzone. That came after Minnesota dropped the disc three times in the endzone. The 1-seed was out, and Carleton headed once more to the finals. Note: The phrase “pulling a Trent Dillon” is officially a thing… and one happened in the double game point. Wisconsin Is Headed To Raleigh! Wisconsin Bella Donna finished their games efficiently this weekend, and it paid off. They won their quarterfinal game 15-4 and had a chance to rest before playing an exhausted Iowa State team who had just survived a hard cap battle with Nebraska. Wisconsin won their semifinal 13-7 and could take a breath once more before meeting Carleton in the finals. Adrenaline can only carry you so far: Carleton quickly fell behind Bella Donna in the first half of the finals. Syzygy ran a poachy zone that tried to stifle Wisconsin’s handler resets, but their legs couldn’t keep up when Bella Donna broke through to their cutters. Wisconsin took half 8-4, and Carleton would only score twice more in the second half. 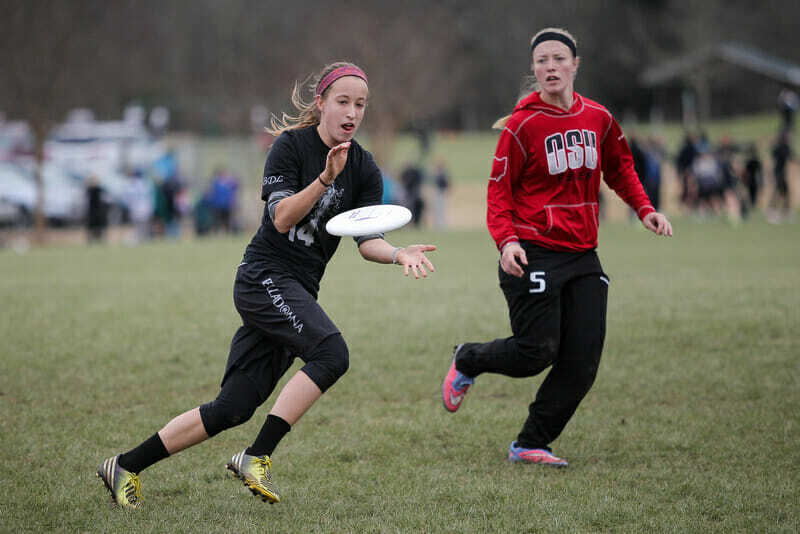 Several suspicions became scripture this weekend for Wisconsin: their rookie class is exceptional, and Lorraine Guerin plays a higher level of ultimate than the rest of us. Rookies like Sabrina Hoffman and Kaitylynne Roling were not only contributors but game changers; both earned and enjoyed minutes in the final alongside the team’s stars like Guerin and Hrovat-Staedter. Guerin, especially, was impressive. No matter what player reluctantly lined up across from her last weekend, nobody could keep up. Blair Holck from Iowa State, almost. But Guerin ran the field like the leader she’s become. She’s the kind of fast, talented player who makes everyone around her look good while still executing poster plays. In a few weeks, Wisconsin will return to Nationals for the first time since 2013. Under Coach Robyn Wiseman’s coaching, with a tight-knit team, I expect great things. Bad news for North Central teams: the Woman Scorned squad they faced last weekend will only be better next year. Iowa State was a breakthrough team in the Midwest this year. They showcased new talents like freshman Megan Halverson while experienced players like Brittnee Grimshaw, Sara Stuedemann, Blair Holck, and Sarah Leichty had a chance to put their chemistry to use. Comments on "North Central Regionals 2016: Tournament Recap (Women’s)"